GBS Hellenic Club had a vasilopita cutting celebration of the new year! Fr. George, Fr. Kosmas and Peter all went to celebrate the new year! Fr. George and Fr. Kosmas gave a brief history of the Vasilopita, St. Basil and the awesome philanthropist that he was and is still. We then cut the vasilopita and distributed it to Hellenic Club members. 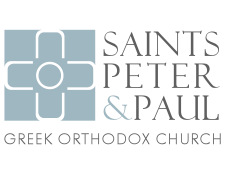 Much of Glenbrook South’s Population attend church at Saints Peter & Paul, St. Haralambos and St. Demetrious, so it was fun to see our GOYAn’s in the middle of the week at their school. Ms. Afrodite Sakouris (a parishioner at St. Haralambos) is really focused on bringing our kids a fuller understanding of Hellenic Culture. We appreciate all that she does and look forward to strengthening our relationship!